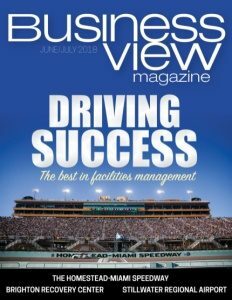 Business View Magazine interviews Al Garcia, VP for Operations at the Homestead-Miami Speedway, as part of our focus on best practices – American sports venues. After Hurricane Andrew decimated the city of Homestead, Florida, some 34 miles southwest of Miami, in August 1992, the Department of Defense decided not to rebuild the heavily damaged Homestead Air Force Base, but rather downgraded it to an Air Reserve base. 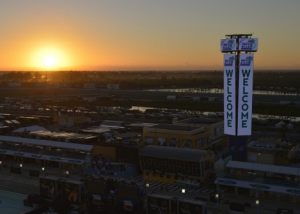 “So, in one fell swoop, the Department of Defense moved about 13,000 enlisted people and their families out of a community that only had 45,000 residents to begin with,” says Al Garcia, Vice President for Operations at the Homestead-Miami Speedway. Groundbreaking for the new 434-acre, 46,000-seat facility took place exactly one year after the hurricane hit, and the track opened in November, 1995. 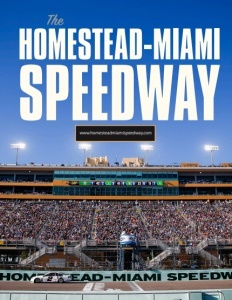 The first NASCAR race at the Homestead-Miami Speedway (which was then called the Metro-Dade Motorsports Complex) was won by Dale Jarrett in front of a sold out crowd. 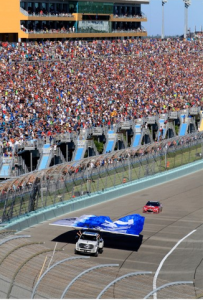 In 1999, The International Speedway Corporation (ISC) acquired the management lease of the Speedway, which is still owned by the City of Homestead. The ISC owns and/or operates 13 of the nation’s premier motorsports entertainment facilities, as well as Motor Racing Network, the nation’s largest independent sport radio network, and Americrown Service Corporation, a provider of catering services, and food and beverage concessions. “The original $75 million barely built the track, and since then, we’ve invested another $150 million,” says Garcia, “putting in a lighting system, building more hospitality areas, doubling the seating capacity, building more media centers, and other infrastructure that was desperately needed.” One major upgrade took place in 2003, when the speedway underwent the most technologically advanced track reconfiguration project in the history of motorsports: a $12 million project that transformed the track from a flat six degrees to a computer-designed 18-to-20-degree variable banking system in the turns. Today, the Speedway employs 50 full-time workers, and many off-duty firefighters, police, and medical technicians also work at the Speedway, part-time, at any number of the 300 events it hosts, yearly, including the final race of the season in all three of NASCAR’s series: the Monster Energy NASCAR Cup Series, the Xfinity Series, and the Camping World Truck Series, all sponsored by the Ford Motor Company. Check out this handpicked feature on The Miami Beach Convention Center.